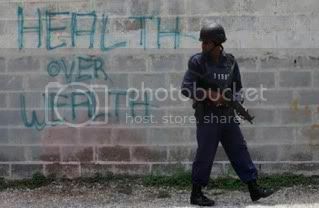 The photo (from the recent JA unrest/curfews/madness) is a little appropriate as I could do with a bit of health right now, the wealth wouldn’t go amiss either. I’ve thrown all me crook energies into getting the Matt Shadetek interview sorted out which is in the post below with a track from ‘Flowers’ that I played tonight and a little bonus too (thanks to Matt for letting us do that). Enjoy and I’ll be back when I’m right, or at least a bit weller ( though I’m more of the Phlegmphather than the Modfather right now).